IDEAL FOR OUTDOORS: Growing medium insulates roots from temperature fluctuations. 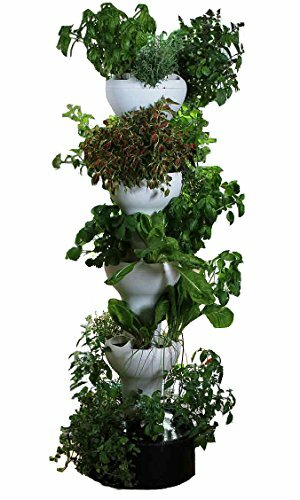 SPACE EFFICIENT & PRODUCTIVE: Growing 40 plants in only a 2 sq ft. area makes it the least cost per planting site of any hydroponic tower on the market. Perfect for home, apartment, schools, office. GROW YEAR ROUND: Move indoors in the winter for year round growing. TIRED OF BENDING OVER? Tower stands 5 feet tall. Easy to plant and take care of.